Holo Franken Polish! - Polish Etc. This is a holo polish I created two bottles of a while ago. (Yep, two bottles... A a college degree and I still can't seem to remember that if you start with a full bottle and add to it you will have an overflowing bottle.) I didn't get around to trying it out until now and I just have to say wow. I amazed myself. I've named it Kindle because it reminds me of setting a flame (albeit a rainbow flame) to coals or ashes. Kindle is a blackened blue with a strong linear holo. The holo is strong enough that it's visible indoors, and in the sunlight it just shines! This is two thin coats with no base coat or top coat and it's very opaque and incredibly shiny. The pictures are from day 2 so it wears pretty well, although with my short nails I usually have minimal tip wear. I'm really glad that I have two bottles now that I've worn Kindle because as per my original plan, I will be giving this away as part of my next giveaway! (I'll be giving away the unused identical bottle.) Now I get to keep one and give one away! 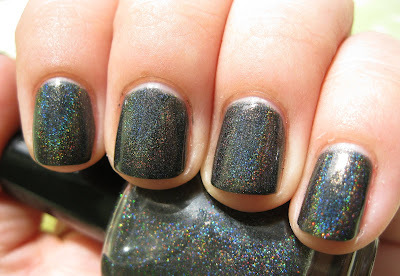 Click Read More for swatches! Indoor direct sunlight. 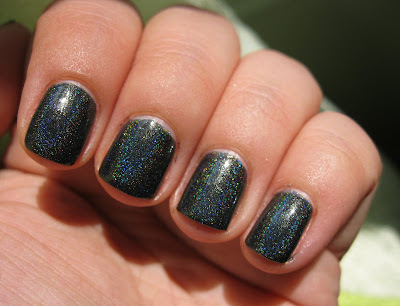 This is what is visible of the holo most of the time, isn't it gorgeous? Indoor indirect sunlight. If you click the image you can see that the holo is still visible even without bright light. This is fantastic :) how did you make it? Spectraflair? wow! came out awesome! was hoping to pull one of, but was a fail.